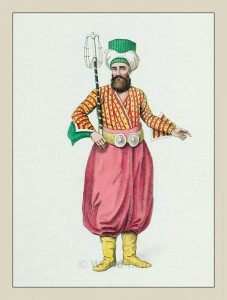 A Usher at the court of the Turkish Sultan. Ottoman empire. Home » A Usher at the court of the Turkish Sultan. Ottoman empire. An Usher at the court of the Turkish Sultan. THAT body of men, to whom Europeans give the name of Ushers, is of a very great use in the court of the Grand Signior, and other oriental monarchs. They are possessed of some rank, though not so honourable as the officers of state. There is a chief usher, who presides over them, and the Sultan scarcely ever stirs without some of this body to attend him. They form a considerable part of the splendor and state of his court, and are employed in various departments. In that excellent work, the Arabian Nights, in which the manners, customs, and characters of oriental nations are pourtrayed in so extensive a manner, and yet with such exactness and truth, there are various descriptions, in which the different employments of these officers are mentioned. This entry was posted in 1804, 19th Century, Military, Ottoman Empire, Turkey Costumes and tagged Octavian Dalvimart, Ottoman Empire costumes, The costume of Turkey on 6/10/13 by world4.